KoopaTV: Ludwig's Reactions to Nintendo Digital Event + Treehouse Live Mario & Luigi: Paper Jam! Ludwig's Reactions to Nintendo Digital Event + Treehouse Live Mario & Luigi: Paper Jam! By LUDWIG VON KOOPA - Heroes always come late. You really think that just because I boycotted the live-showing of the Nintendo Digital Event that I wouldn't give KoopaTV my thoughts of it? It's my own site! I'm doing a live reaction log ALL BY MYSELF. If you want Rawk and Vortexica's reactions (Kamek was actually at E3 so he couldn't live-react), then click here. Rawk and Vortexica show up when you can ctrl + f "3:51". That's when we watch Mario & Luigi: Paper Jam. So... Uh... how did I take the event? Find out below. I'm watching the Digital Event alongside reading Vortex and Kamek's log, which is how we honestly think you guys read these Live Reaction Logs. so do we just stay quiet while you log? After this you can read our log. The conference is rated E? "My puppet body is ready"
Rawk: is this gonna be a game? Arwing is a walking bird? "Star Fox Zero Holiday 2015"
Miyamoto having sexual relations with shrines. Oh, Slippy is in the game. That's the entire reason I even like Assault. "Star Fox is a game where you use a control stick, like you'd find on a plane." Miyamoto's usage of GamePad seems extremely pointless. Only one button to fire "all the weapons"
So is it a prequel? Not this freaky Falco stuff. A "theme" we'll see consistently. Reggie claims that Super Mari0 Bros. hasn't stood still. Reggie claims he'll play and beat our levels. Is this the 3rd party team-up? "Hammer Slam Bowser and the Clown Cruiser"
Reggie apparently looks and acts like Bowser. The Legend of Zelda Triforce Heroes? Four Swords with only three dudes? "And show each boss who is boss"
These bosses don't look very threatening. So this game is single-player as well. In single player the other characters are dolls. ......I wouldn't wanna play this though. Wind Waker characters to "expand the gameplay"
...That's not "expanding the gameplay". Rawk is taking a road trip? Damn, Metroid spin-offs don't work well. "YOU ARE MY CHILD NOW"
AND....WAS HAPPY TO FORGET IT. I think Isabelle usurped Tom Nook as Animal Crossing mascot. so this... is wot they meant? People were like "They didn't have all those Wii U models for nothing!" Kamek is on top of a shelf. Samus Yoshi looks nothing like Samus. Why would I wanna help the town of Springdale? so AlphaDream got Paper assets and wanted to apologise for Sticker Star? Tezuka is a Miyamoto clone now. Well this is nice art. At least Miyamoto isn't talking about Paper Jam now. He's not gonna interfere it, right? 'cause it's obviously an apology for Sticker Star's existence? 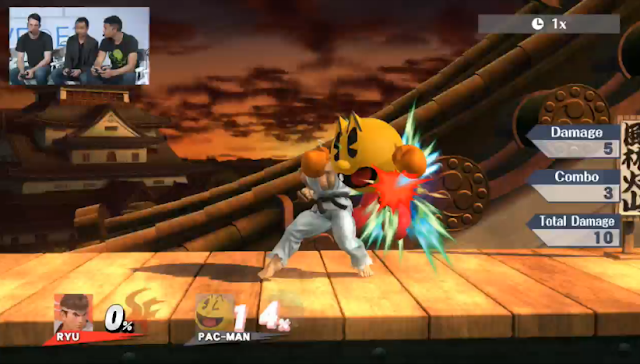 You could shoot fireballs from a Lakitu Cloud way before now. "we have a lot of these planned"
NSMB music for some reason. Miyamoto acknowledges he's a mean person. "Try it if you want to get into game design." Next, Nintendo Treehouse Live begins. On, uhh, Friday and Saturday? Mari0 claims to be inside all of us. Just... err, switch off now. Wait, there's 3 minutes left! Well, Nintendo isn't winning E3 at this rate. and look cool as an older man with a guitar. .....It's asking me to share my own idiotic video. Is this Nintendo's attempt to beat the Shenmue III Kickstarter? They're showing Paper Jam on the Treehouse. Petey Piranha now in progress. Nope, they still are lol. Well it's good to see PM in something not completely terrible. this could still very well be bad. Since Sticker Star was actually a better game than Dream Team, feelings aside. I don't believe you. Now I wanna get Dream Team. 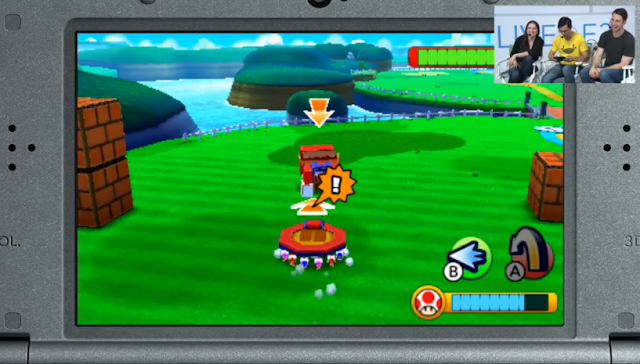 Dream Team is a giant tutorial! Speak of the devil, a tutorial flies in right now! Well here's a tutorial right now. This looks like Dream Team DLC. By the way, I told you they wouldn't spend their conference discussing DLC! "I hope he made lottsa spaghetti!" So Paper gets two moves a turn? 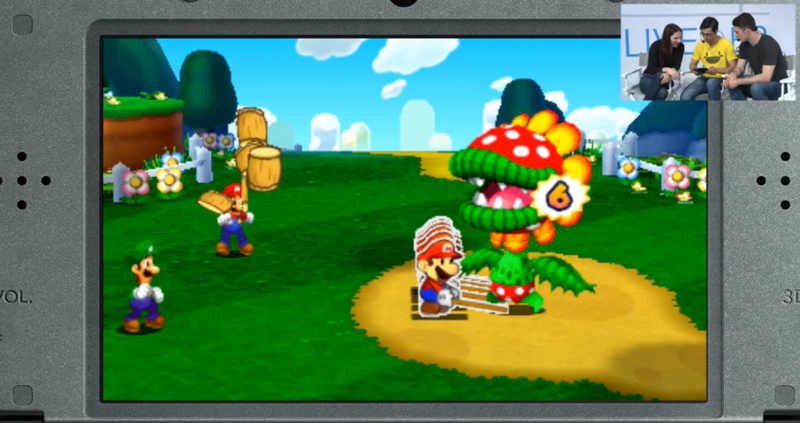 So Paper Mario is now a photocopier apparently. They feel bad about Petey Piranha. They don't show the airplane tutorial a second time. I dunno, this seems fine. BTW, noticed on the UK Direct this is called "Paper Jam Bros." over here. They said AlphaDream is working on it. Honestly, I'll take a so-so Paper/M&L game. Paper Bowser has at least one word of dialogue. Is that a Minecraft thing? Did you think you were dreaming while watching this trailer? "When the hell is Nintendo going to show something good?" This means, as a character, you can hate Paper Mario less than regular Mario. Because he's a different character? Is this how he's gonna get into Super Smash Bros? 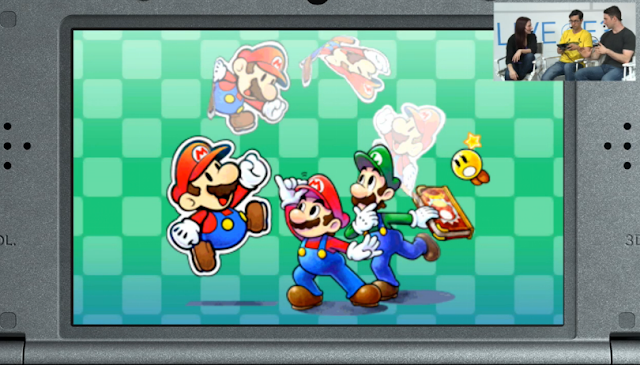 And Paper Mario actually befriends some Koopas. Because he's finally confirmed to be different? And doesn't hate them unconditionally. Like the other Mario does. Maybe even M&L Mario is his own Mario. Is Dr. still the same dude? This ruins a lot of other things too. They're running out of time. So I just saw "WE'LL BE BACK IN JU"
And thought that was "JULY"
I can't watch Star Fox. What am I doing with my log and that half-Paper Jam? we're not logging everything are we? We gotta have something from Treehouse at least once a day. "Take a few minutes to look at the new DLC"
I definitely approve of beating up Pac-Man on-stream. 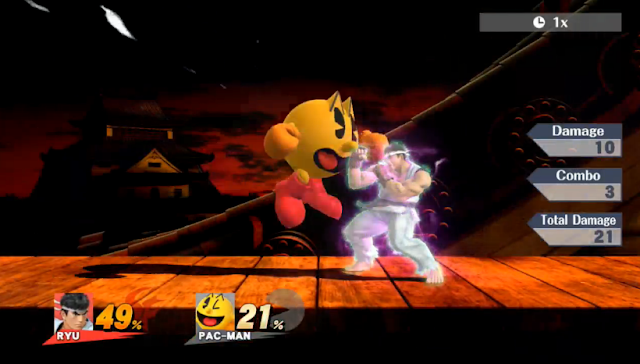 Good job, Ryu. Ludwig bought the Ryu DLC on Sunday night but never played the game, or any other videogame. Besides Pokémon Shuffle for this reason. Will Ludwig go play Super Smash Bros. For Wii U or will he do his KoopaTV duties of keeping up with Treehouse Live? Stay tuned! 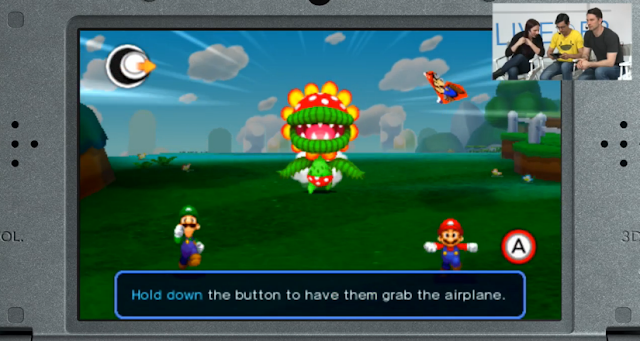 There really is more Treehouse Live today, with Super Mario Maker! That "transformation" thing stood out to Ludwig that he wrote a whole article on it. Ludwig live-reacted to Nintendo's whole conference just with himself in 2013, too. I'm hopeful for Paper Jam. Still need to play Dream Team, though. *I* still need to play Dream Team. It's on sale on the eShop now! According to Rawk, Dream Team is somehow worse than Sticker Star. Maybe I'll play it after I finish Link's Awakening.